Heavy Duty Brick netting is used extensively within the building, construction, industrial and haulage sectors. They are used to transport bricks, masonry products, paving stones, wood, and other general building materials and waste. 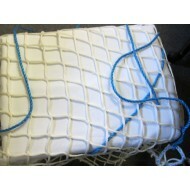 The nets are able to adapt to various load shapes and sizes, and are especially well suited for use with uneven loads. Our brick nets are made from 100% nylon yarn and are finished with a peripheral rope and 4 tie ropes. The nets are very durable and are UV stabilised, which gives it better durability in all-weather use. Nylon yarn has the unique ability to stretch rather than break, meaning if there is misuse or an accident and the net is cut, the hole is contained until the net can be repaired.